Assam is located in the northeast of India. The state shares its borders with Arunachal Pradesh, Nagaland, Manipur, Mizoram, Meghalaya, Tripura and West Bengal. The state shares international borders with Bangladesh and the Kingdom of Bhutan. Assam is India's gateway to Northeast India and acts as a vital link for trade with Southeast Asian countries. The state is known for its tea, petroleum resources, muga silk and bio-diversity. It is also becoming an increasingly popular destination for wildlife tourism. 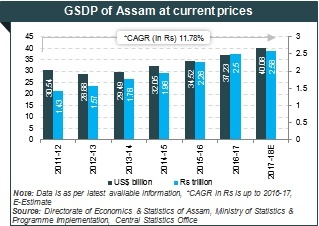 At current prices, the Gross State Domestic Product (GSDP) of Assam was Rs 2.50 trillion (US$ 37.23 billion) in 2016-17. It is estimated to have reached Rs 2.48 trillion (US$ 40.1 billion) in 2017-18. The GSDP of the state grew at a CAGR (in Rs) of 11.78 per cent from 2011-12 to 2016-17. The state is rich in water resources and has vast tracts of fertile land. Assam is also the third-largest producer of petroleum and natural gas in the country and has ample reserves of limestone. With its five national parks and 18 wildlife sanctuaries, the state is a biodiversity hotspot. Other potential areas of investment include power and energy, mineral-based industries, tourism and crude oil refining. 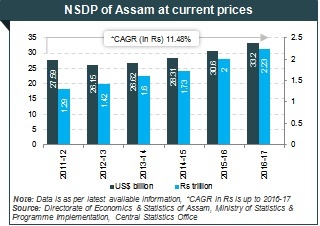 Assam has adopted numerous investor-friendly policies to attract investments and accelerate industrial development. Key areas of focus include the IT, tourism and power sector along with several other initiatives such as the North East Industrial and Investment Promotion Policy (NEIIPP) 2007 and the Industrial and Investment Policy 2014. Assam stands 22nd among Indian states in rankings based on ease of doing business and reforms implementation, according to a study by the World Bank and KPMG. According to the Department of Industrial Policy & Promotion (DIPP), cumulative FDI inflows in North-Eastern states during April 2000-June 2018 stood at US$ 110 million. During 2017-18, total exports from the state stood at US$ 382.35 million. Exports from the state stood at US$ 154.87 million during 2018-19**. Government of Assam has started the project preparatory activities for the World Bank funded Inland Water Project under the Inland Water Transport Department at Rs 975 crore (US$ 150.60) which will help realise the huge untapped potential in this sector. The 9.15-km long Bhupen Hazarika Bridge over the Brahmaputra river in Assam is India’s longest bridge and will reduce the travel time between Assam and Arunachal Pradesh from six hours to just one hour. In March 2017, the state government launched Sarothi. The scheme offers financial assistance in form of loans from bank with a subsidy on interest rates. As of January 2018, all the villages of the state (excluding uninhabited and grazing reserve) have been electrified under Rajiv Gandhi Grameen Vidyutikaran Yojana (RGGVY). Tea: During 2018-19**, production of tea in the state stood at 467.68 thousand MT. Agriculture and Allies: An agrarian economy since time immemorial, agriculture is the major contributor to the state economy. It also provides livelihood to a significant proportion of the population of the state. The agro-climatic conditions support cultivation of a wide range of horticultural crops, including plantation crops and various fruits and vegetables, flowers, spices, medicinal and aromatic plants, nut crops and tuber crops. Pineapple, banana, cauliflower, Broccoli, rose, rice, papaya, sugarcane, turmeric, jute, potato and Bougainvillea are among high yielding varieties of horticulture crops in Assam. It also includes traditional fruits like Carambola, Leteku, Paniyal Thekera, Au tenga etc. Total production@ of horticulture crops in the state in 2017-18* stood at 7.04 million tonnes with 710.44 thousand hectares area under production. Sericulture: Assam enjoys global monopoly in terms of Muga silk (also known as golden silk) production. The state accounts for around 95 per cent of global Muga production. Moreover, Assam is the country’s major Eri silk producer (accounts for 65 per cent of the country’s Eri silk production). Raw silk production in Assam and Bodoland reached to 1,316 MT in the year 2018-19 (Up to May 2018). Tourism: In 2017, 6.07 million tourists arrived in the state of Assam.